,t to State regulation on account of plant pests. Lnts entirely within the State. )logy, State Capitol, Atlanta 3, Georgia. logy and Plant taarantine, Washington 25, D. C.
ferns, cacti, flowering annuals, etc.). monts of nursery stock and hold them for inspection and disposal. flowers, arnd camellia plants with flower buds showing any traces of color. flower buds showed no traces of color at time of shipment. beets with tops or stems; and rhubarb. urder safeguards to prevent spread of the borer. Ma s sachu s e t t s Vi rgi ni a.
parts thereof for propagation, except fruit pits. inspectors of all peach and nectarine trees within such 5-mile area. swectootatoes must be dipped into fungicide before bedding. 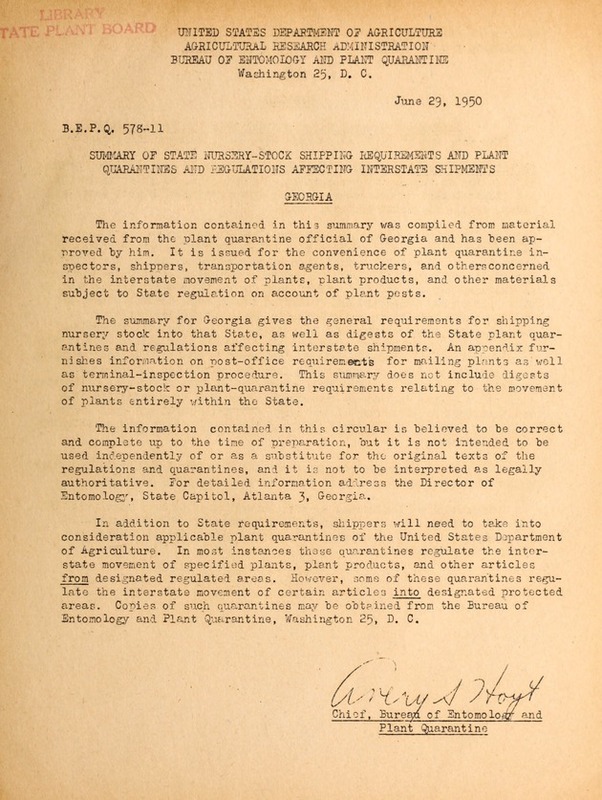 must purchase Georgia certificate tape. thereof; and virics and roots 6f all plants belonging to the genus Iporoea. giving name of consignee, destination, ani siz4 of shipment. an Ruthorized State or Federal inspector, to the out side of each container. Lee, Lowndes, Mitchell, Pierce, Seminole, Thomas. Wi la~cy I", ~m~n' filson, Zapata, Zavala. Tobacco plants may not be ,;,ovcd from the regulated areas into Georgia. .ts and plant diseases, which also show where the plants were grown. .dn State Plant Board, Gainesville, Florida. plant quarantine official is given in the preceding summary. products and the plant pests transmitted thereby, which are to be examined. Postmaster General whereupon postmasters will be informed and instructed. )oint of inspection to the addressee upon payment of postage. of the above-mentioned States, District, and Territories.